We started the morning by looking for some Eriosyce (Thelocephala) on the nearby hillside – Gustavo seemed to smell them from hundreds of meters away, while we had difficulty spotting them right in front of us. Once the early morning dew had evaporated and our tents were dry enough to pack, we made for the Tigrillo Valley, the next valley north of Guanillos (S080). 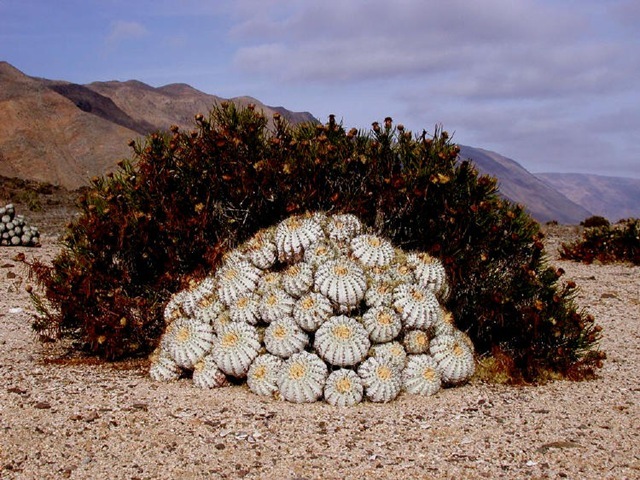 The Copiapoa here were still C. longistaminea, but different from the plants in the Guanillos Valley. This is the form that Karl Knize called C. trigrilensis. Once again, many of the stems had a dark, corky base to the stem. We had seen this on other Copiapoa and were to see it again, particularly prominent on C. cinerea ssp. columna-alba. Raquel Pinto suggested that this was an organism called ‘Nostoc’, a cyanobacterium that grows on (and inside?) the spines and the epidermis of the plants. We drove inland and found a valley with lots of small C. columna-alba (S081), growing alongside two different Eriosyce (Neoporteria) sp. and, on a flat, another small Copiapoa sp. growing pulled down into the gravel and dust Were these plants, with a narrow neck connecting the body to a large taproot, C. grandiflora? Further inland still, in a wide, flat valley (S082) we found more plant that, from my notes, we IDed as C. grandiflora – single headed plants, pulled into the ground. Marlon and I hitched a lift with Gustavo, back to Secret Valley and on, up a steep cliff track, to Las Lomitas (S083), a high cliff fog zone at the northern end of the Parque Nacional Pan de Azucar that offers spectacular views over the Pacific Ocean and the Esmeralda Valley – if it had not been for the fog. So instead, we focussed our cameras on objects closer to the lens: at guanacos and small desert foxes in a landscape dominated by Eulychnia, Echinopsis (Trichocereus) and low shrubs, all covered in lichen. We did not stay long, as we would be back with the rest of the party. On the way to Chañaral, we made one more stop (S084), inside the National Park, at Playa Blanco, to take some pictures of the Copiapoa cinarescens, growing along the track. At the Hosteria in Chañaral, we met up with two more Chileans with whom I had enjoyed email correspondence prior to the trip: Ricardo Keim and Ingrid Schaub and discussed our plans for the next few days. if it could get there legally – but it’s best seen in nature, with its friends.